Chinchillas (affectionately known in Chinchilla circles by their nickname “Chin” or “Chins”) look like a cross between a rabbit and perhaps a mouse, but they are actually more closely related to guinea pigs than to rabbits. They are a popular pet because of their quirky and unique personailities, their super plush fur – fur that is so dense that even parasites like fleas cannot live in it – and of course how incredibly cute they are! Our friends over at WebVet talked to Lani Ritchey, the president of California Chi and Chinchilla Rescue about how Chinchilla rescue is growing. You can read their interview with her about Chinchilla Rescue here, and also find out some basic facts about Chins and their care that have been reviews by a veterinarian. 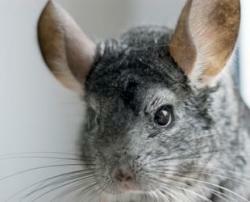 As with any pet, being informed and prepared for the responsibilities of Chinchilla ownership are key in keeping your pet happy and healthy, so you can enjoy them with your family for their entire life. What do you think? Click an icon below to share your comments and this article on Facebook, Twitter, and more!